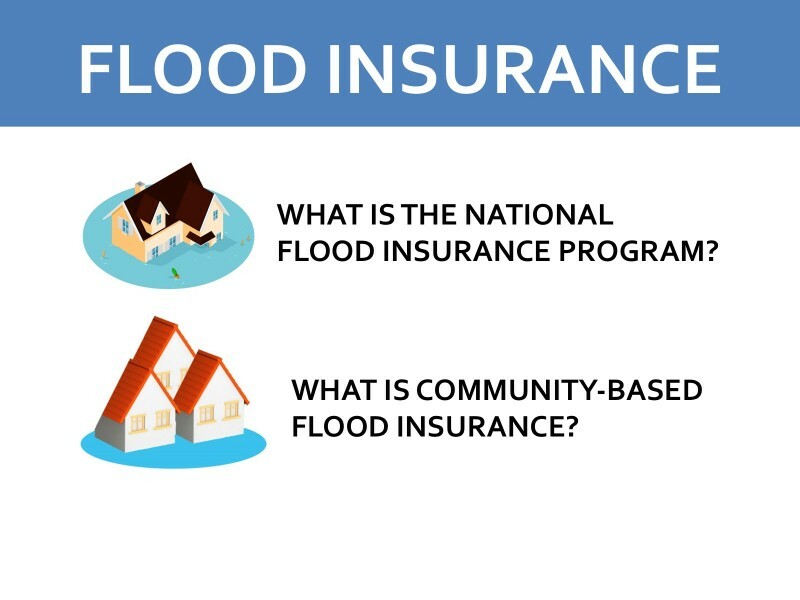 In 1968, Congress created the National Flood Insurance Program (NFIP) to help provide a means for property owners to financially protect themselves from flood losses, which are not covered by standard homeowners insurance policies. 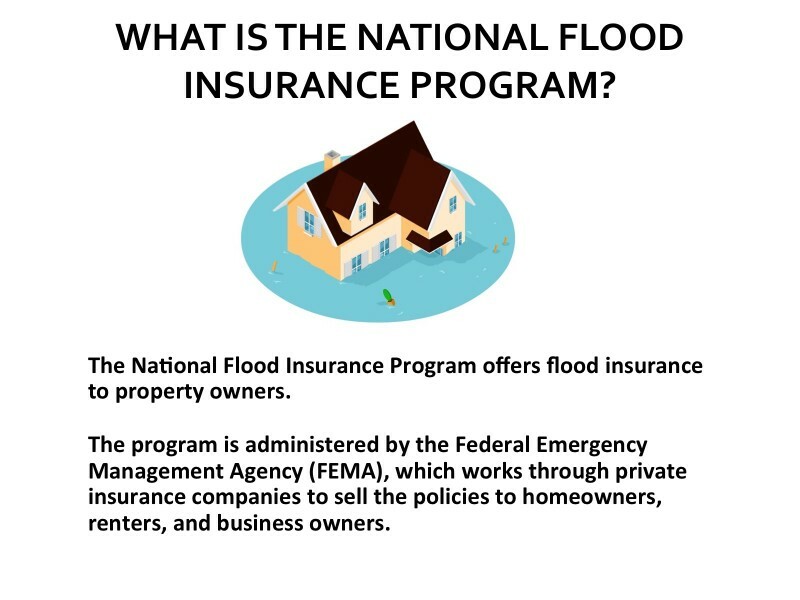 The NFIP offers flood insurance to homeowners, renters, and business owners if their community participates in the program. Participating communities agree to adopt and enforce ordinances that meet or exceed FEMA requirements to reduce the risk of flooding. Rates of most NFIP policies are based on an estimate of the total revenue from all policies that would be required to cover insurance claims in a typical year, calculated using the “the historical average loss year.” This pricing and funding strategy proved to be a workable financial management approach from the program’s launch in 1968 until 2005, a period that was largely free of major flood losses. 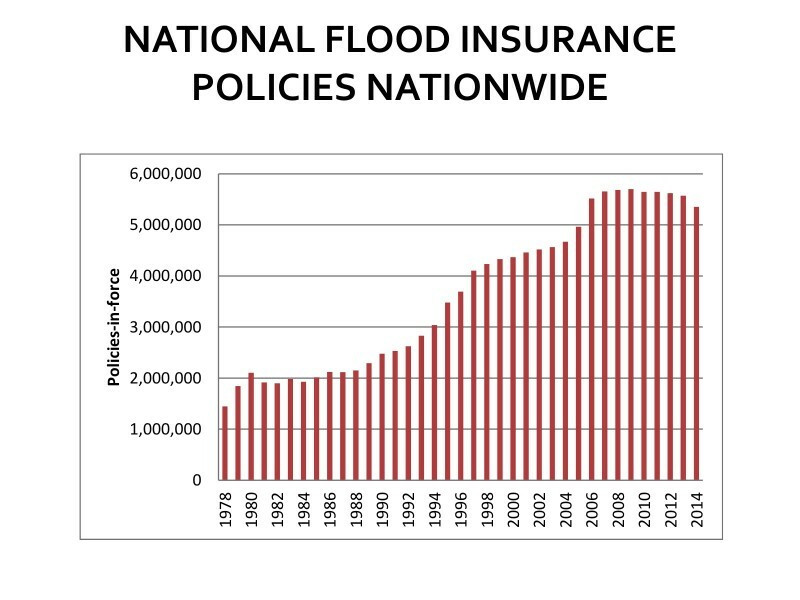 There are about 5.5 million National Flood Insurance Program policies in effect nationwide. 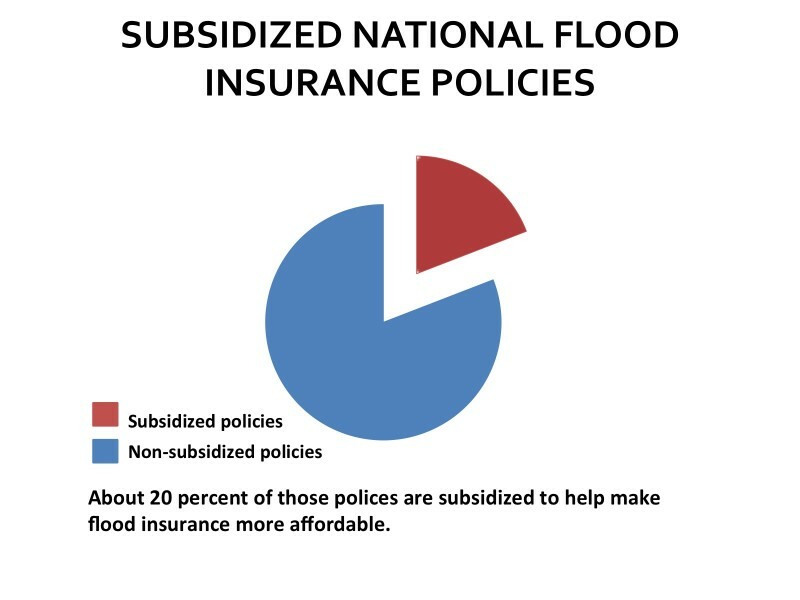 To keep costs to policyholders low and encourage widespread participation, the National Flood Insurance Program offers several types of subsidized policies. The Program’s pricing and funding strategy proved to be a workable financial management approach from the program’s launch in 1968 until 2005, a time period that was largely free of major flood losses. 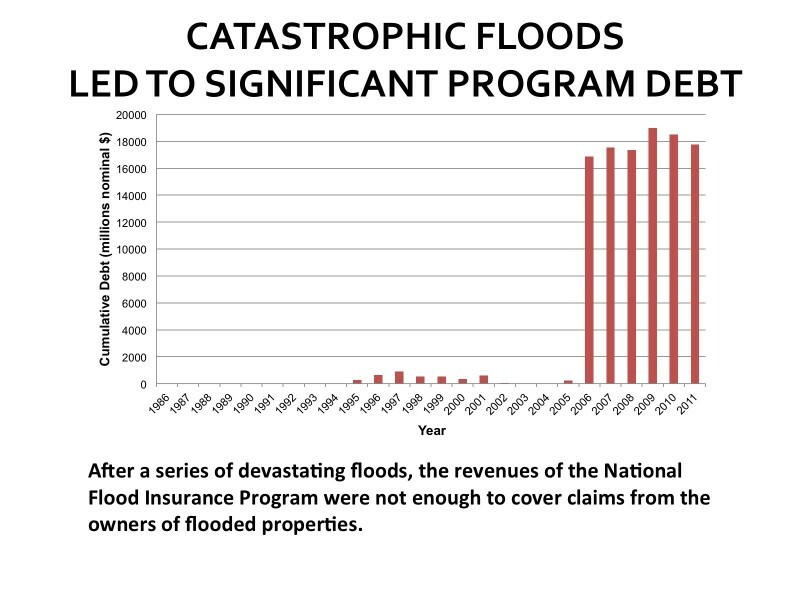 However, a series of catastrophic loss years, starting in 2005 with Hurricanes most notably Katrina, Rita, and Wilma, led to significant debt as the income from NFIP premiums was not enough to cover claims from the owners of flooded properties. The NFIP borrowed money from the US Treasury to cover the shortfall. NFIP debt totaled $17.75 billion in January 2011 (see chart, Congressional Research Service report). A 2015 GAO report found that program debt through 2014 totaled $23 billion. Concerned over this debt and how it might grow, Congress passed the Biggert-Waters Flood Insurance Reform and Modernization Act in 2012. 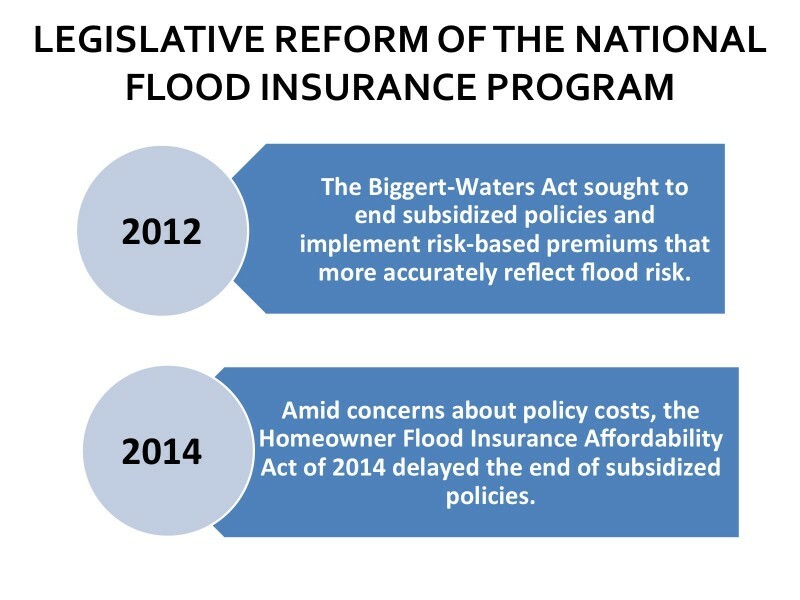 This legislation aimed to improve the financial foundation of the NFIP by ending subsidized policies and implementing risk-based premiums that more accurately reflect flood risk. However, amid widespread concern about the financial burden this legislation would cause to policy holders, Congress passed The Homeowner Flood Insurance Affordability Act of 2014, which delayed the end of subsidized policies. 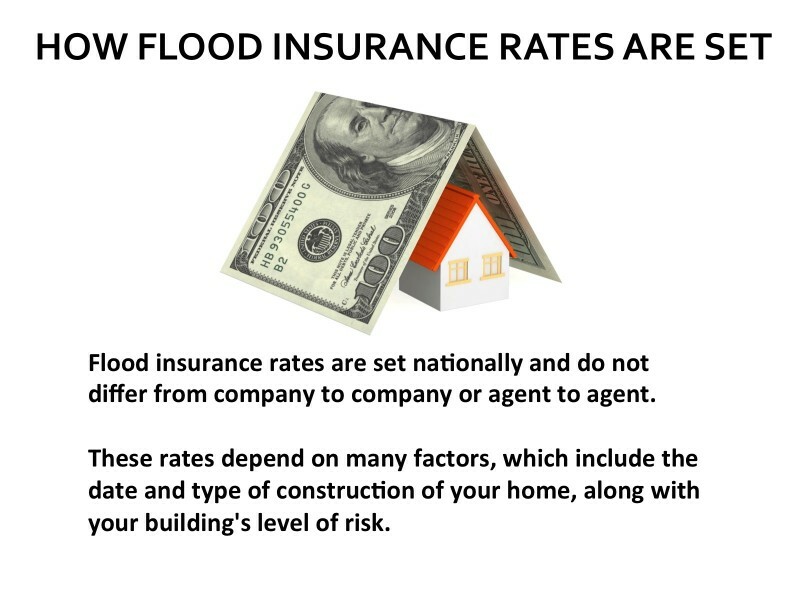 Today in the United States, flood insurance is primarily offered through the National Flood Insurance Program via individual policies. 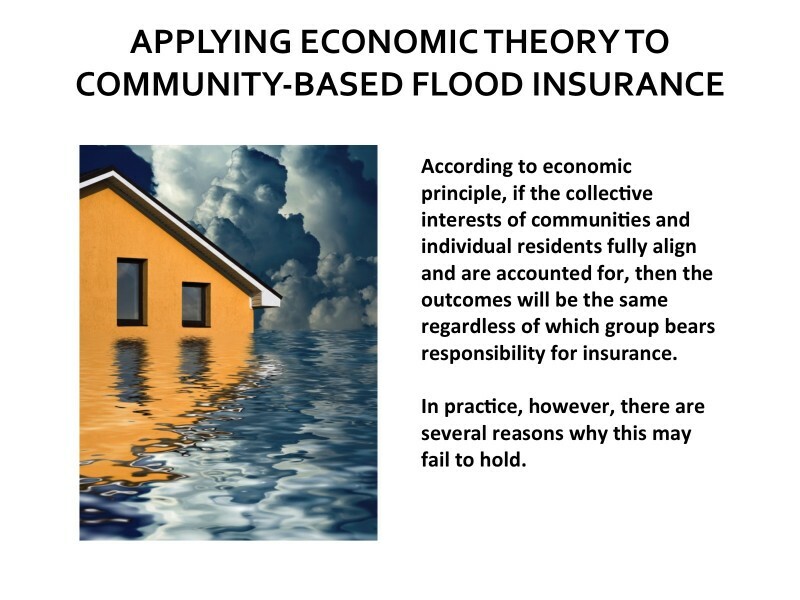 Community-based flood insurance is a theoretical concept that has been discussed within the flood risk management community, but has not been implemented as a policy option in practice. 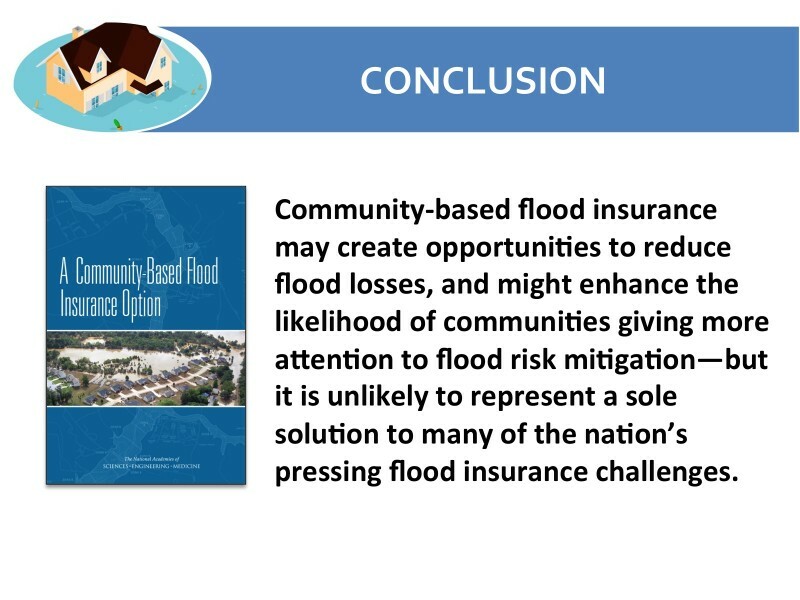 It is thought that community-based flood insurance could increase coverage purchase rates, promote mitigation and floodplain management strategies that reduce risk to individual properties, reduce premiums, and cut down on National Flood Insurance Program administrative costs by issuing collective policies rather than individual ones. 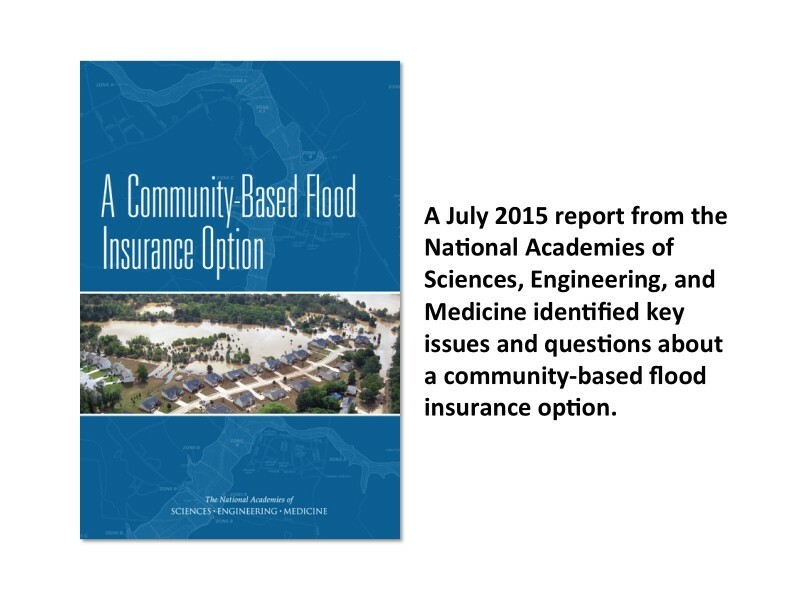 A July 2015 report from the National Academies of Sciences, Engineering, and Medicine identified key issues and questions about a community-based flood insurance option as “food for thought” for FEMA and Congress as they weigh both the possible benefits and challenges of a community-based flood insurance option. The report found that a community-based flood insurance option may create new opportunities to reduce flood losses, but is unlikely to provide the single solution to the nation’s pressing flood insurance problems. 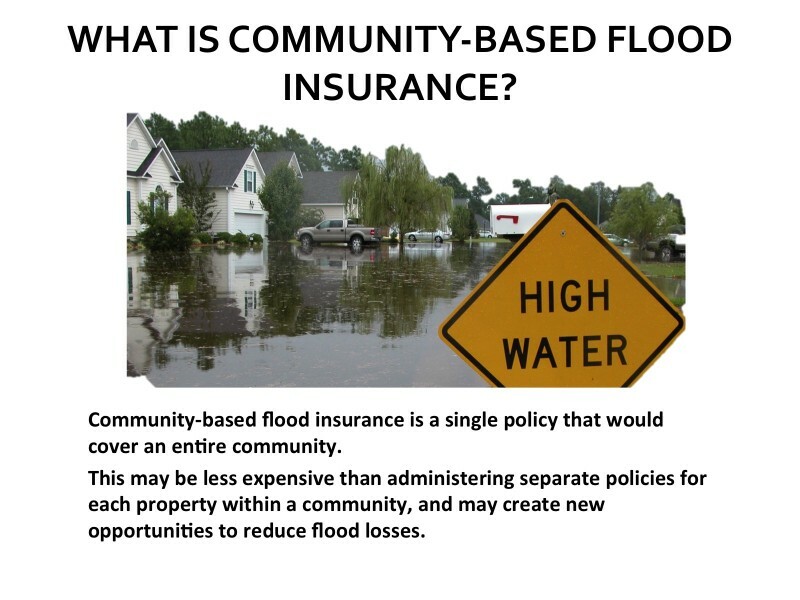 There are many forms that community-based flood insurance could take. 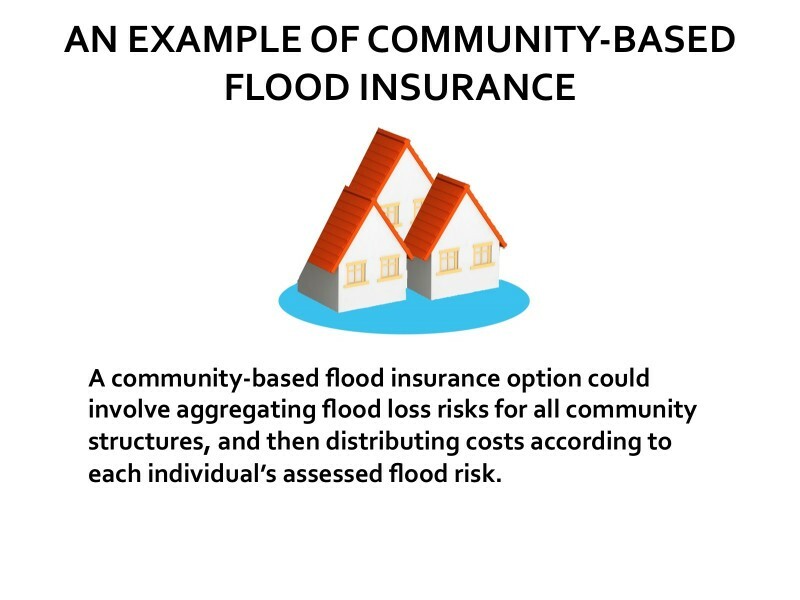 One example is a community-based flood insurance option that would involve aggregating the sum of flood loss risks for community structures, and distributing costs according to each individual’s assessed flood risk. Premiums could be collected using mechanisms such as property takes or utility charges. 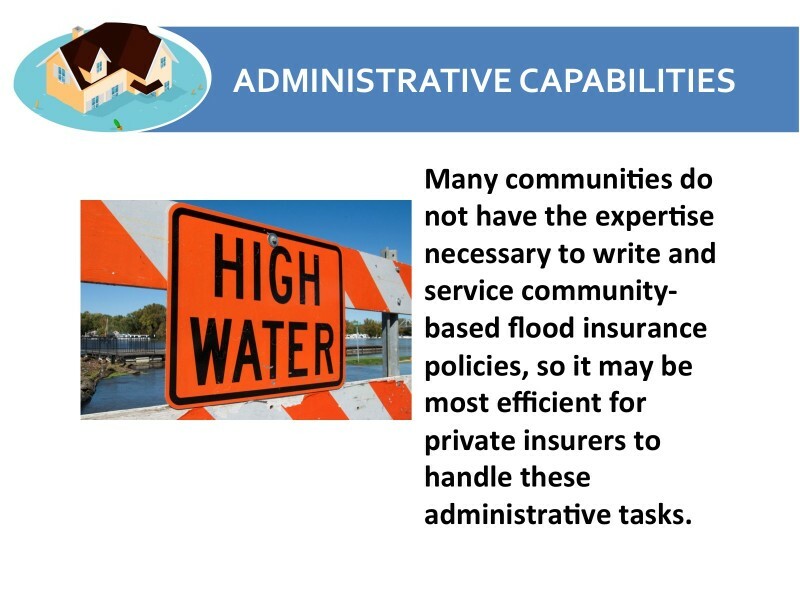 FEMA defines a community as a “political entity that has the authority to adopt and enforce floodplain ordinances for the area under its jurisdiction. “ Although a city or town would qualify, it is unclear whether the definition could be extended to a neighborhood, a gated community, or a business district. More explicit definitions will be needed if community-based flood insurance is implemented, the report says. The report points to an economic principle that says if the collective interests of communities and individual residents fully align and are accounted for, then the outcomes will be the same regardless of which group bears responsibility for insurance. In practice, however, there are several reasons why this may fail to hold, including when some or all residents “free-ride” and don’t buy insurance because they expect post-disaster relief. 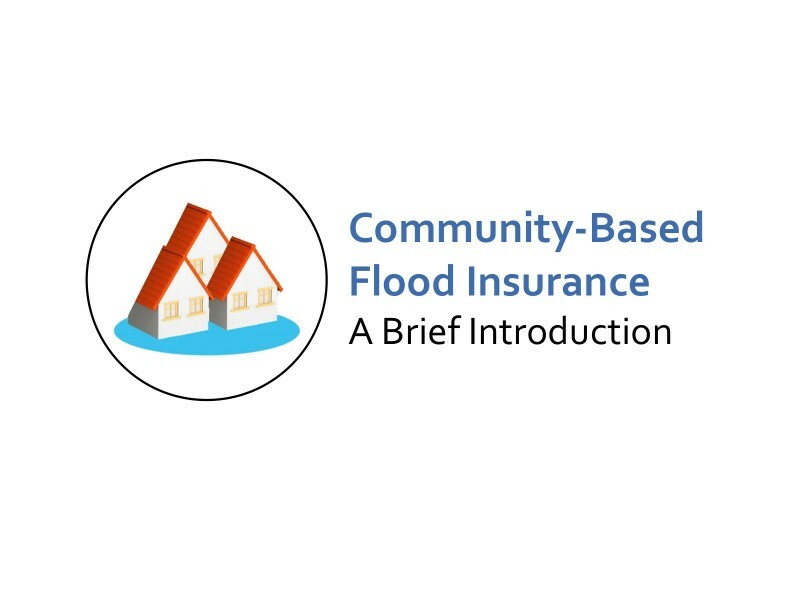 The report lists eight such reasons that, depending on the underlying circumstances in a community, can help guide decisions about when community-based flood insurance may be more or less preferable than insuring at the individual level. 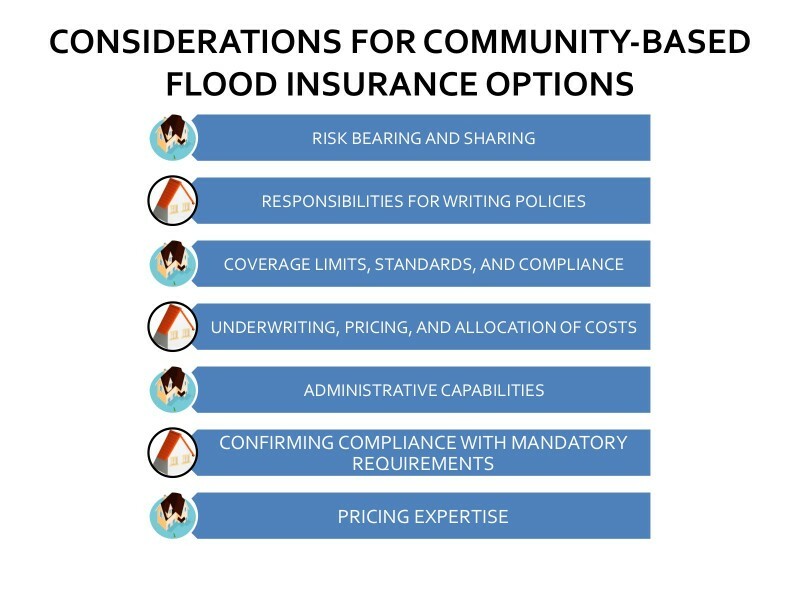 The report’s authoring committee identified a series of factors for consideration when planning for and designing community-based flood insurance options. These range from deciding who will take responsibility for writing policies at the community level to determining how to price community policies. For more information, see the full report. The National Flood Insurance Program currently bears the financial risk of catastrophic loss years. 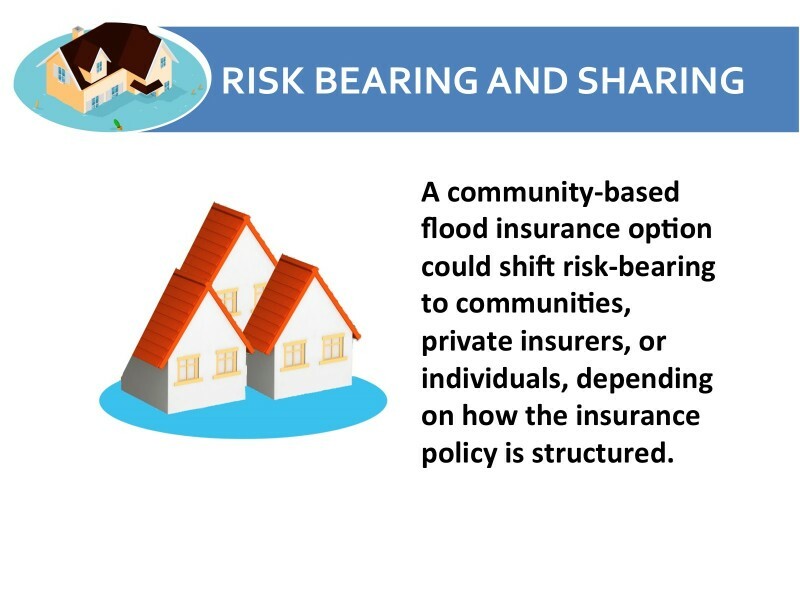 Community-based flood insurance options may allow for a reexamination of how some risks could be shared by other stakeholders. If insurance contracts remain the vehicle for transferring risk, private insurers likely would remain as efficient entities for handling their administration. Communities (probably regardless of definition) would likely not have adequate expertise for undertaking the administration of policies. However, some definitions of community include entities that could effectively and efficiently collect the revenue needed to pay for a community policy through special assessments, property taxes and other sources. Congress mandates that properties in high-risk flood areas with mortgages from federally regulated or insured lenders are required to have flood insurance and that the insurance policy cover the amount of the federally backed mortgage. 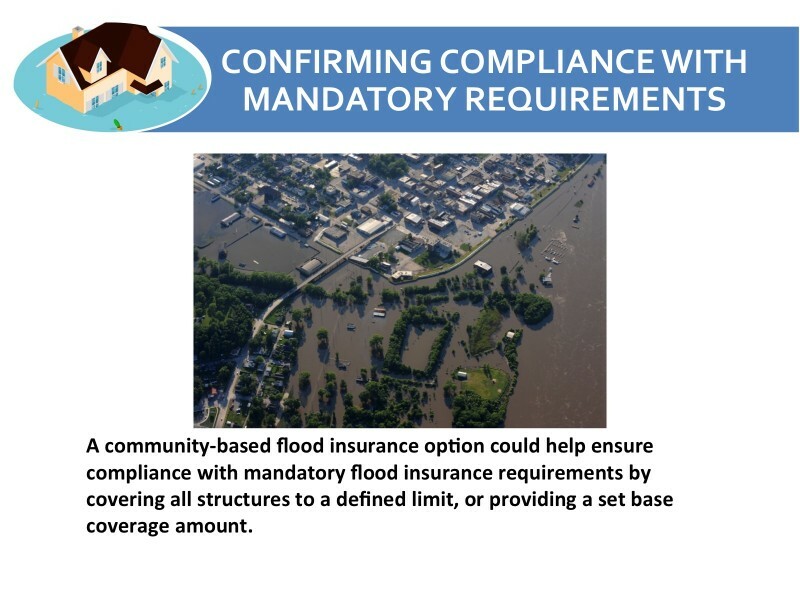 A community-based flood insurance option could make it less burdensome to ensure that all properties in a community comply with this mandate.